The other day, I actually took the effort to comb my hair, put on foundation and shave my legs for a big date with a 3 cheese Lasagna. But, the frozen Lasagna from Albertsons stood me up and his cousin showed up instead - a pill of noodles with no cheese and some sort of red sauce. 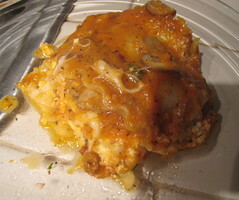 After a whole week of looking forward to this Lasagna, I was left feeling empty and disappointed. So, this weekend I was inspired to try my first attempt at making Lasagna. If I can tell you myself, my Lasagna was a good mixture of saucy, cheesy goodness. It was a good date. It could have been better, but I think it was the 1st date nerves. In my next attempt, I will need to cover the dish before baking, burnt noodles are not a good look, and control myself from eating the mozzarella. The top layer was a little sad because I ate all the cheese. Heat 2 tablespoons of olive oil over medium-low heat. Bring the sauce to a simmer and cook over low heat. Add ½ of the basil and parsley and cook until a good sauce texture, 15 minutes. Cool and put through a blender. (Do not blend too long, like I did. Look for a smooth, but not lumpy sauce. This will help hold the Lasagna together.) Reserve. Heat 2 tablespoon of olive oil in a clean pot. Add sausage and sauté, 5 minutes. Add mushroom and sauté, 2 minutes. 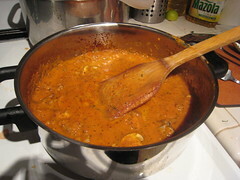 Add the reserved tomato sauce and bring to a boil. Reserve. Combine the ricotta, parmesan, eggs, parsley and basil. Mix Well. Add the noodles and stir well to separate. Cook until tender, but not overly soft, about 8 minutes. 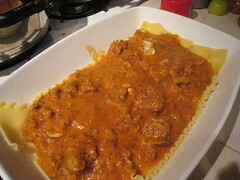 Drain the Lasagna at once and rinse with very cold water. Reserve. Spread a small amount of sauce on the bottom of a buttered baking pan. Lay 3 pieces of noodles, overlapping them on a 9 by 13 inch baking pan. Add the sauce about ¼ mm thick. 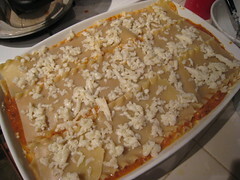 Cover with sauce and top with mozzarella and parmesan. Cover with tin foil and bake at 375 for 30 minutes.